I am a fan of freshly ground coffee however it’s my co blogger Simon who is the expert when it comes to making and drinking it- he can’t start the day without his 6.30 a.m Macchiato! 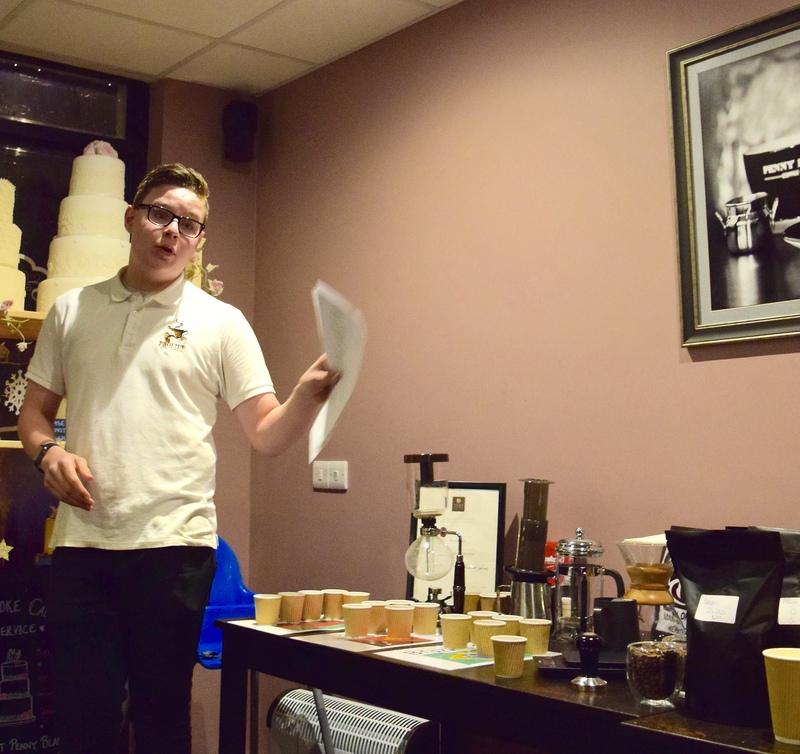 I was lucky enough to be invited to the first coffee tasting evening organised & run by Ben Garnett, the World’s Youngest Professional Barista and Coffee Entrepreneur last week. Ben’s interest in coffee grew when at 13 years old he started a part time job working in Penny Blacks, his local independent coffee shop in St Johns, Woking, Surrey, UK. He started his barista training culminating in his Professional Barista Qualification last year, aged 15. Ben had already invested in a small coffee roaster and was roasting beans from Malawi, and selling at his school fete, to raise money as part of the school’s link project with a Malawian school. 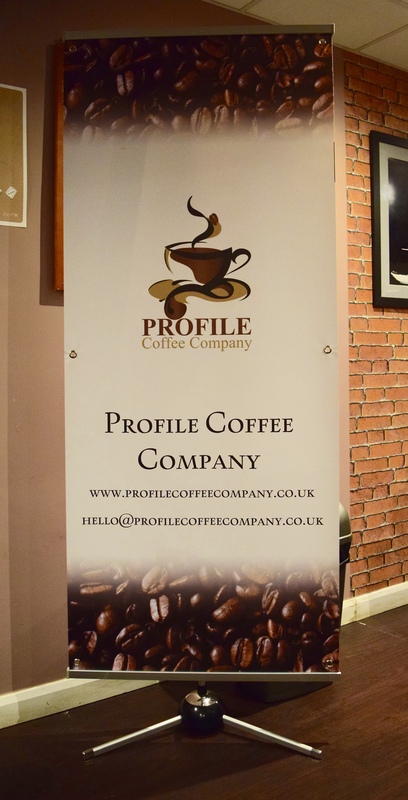 This link has grown from strength to strength (excuse the pun) and now is one of the core coffee beans Ben sells on line along with 12 other coffees from Brazil, Costa Rica, Columbia, Ethiopia, Indonesia, Kenya, & Papua New Guinea at Profile Coffee Company, the business he set up in 2015. Ben has invested in a larger roaster and now has his own dedicated production room. 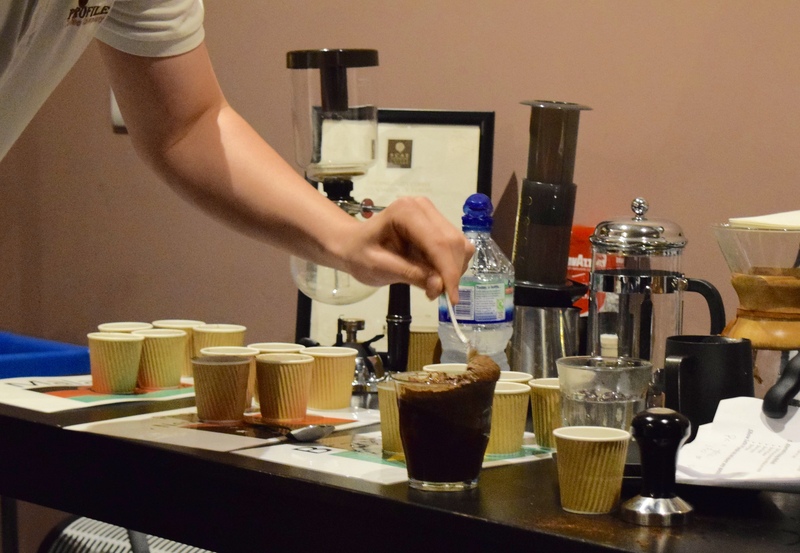 At the coffee evening I learnt all about the types of coffee beans, the difference between Arabica & Robusta beans, where they are grown, how coffee is harvested as cherries, processed, roasted and finally ends up as a great tasting cup of coffee. 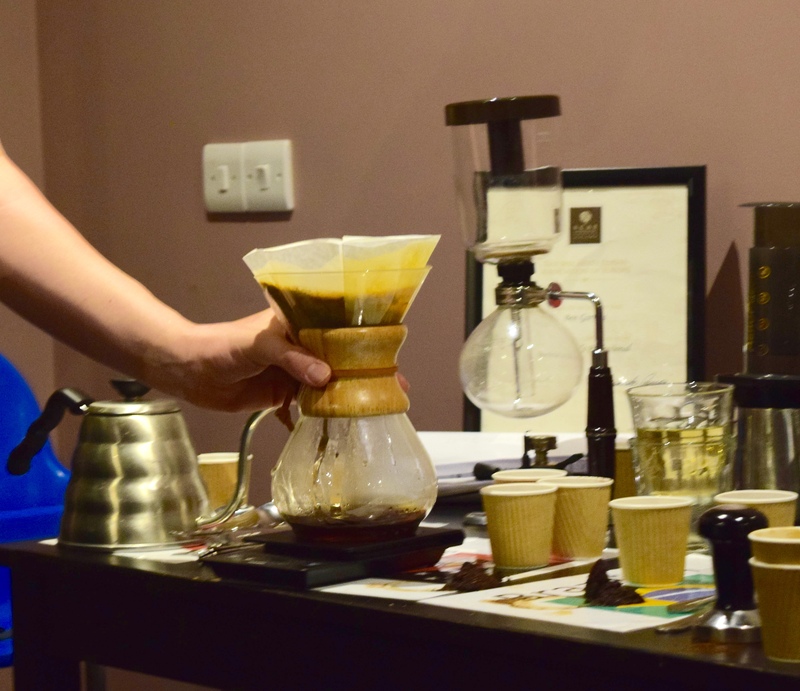 Ben demonstrated the cupping process, the method professionals use to taste & evaluate coffee. I had a go at slurping 3 different coffees off a spoon, between sips of water, expertly roasted & brewed the same day. Amongst the 20 of us, there was a pretty even split on preference between the Malawi, Papua New Guinea & Brazilian Coffees. My preference was the Malawi Chikali Medium Roast: smooth, rounded flavour, slightly fruity with a nutty/mocha aftertaste- pretty complex. Malawi only produces 0.01% of the World’s Coffee so it is pretty rare, as well as tasting delicious. I also enjoyed the Brazilian coffee which was darker, with a caramel & nutty taste. Profile’s unique selling point is freshly roasting coffee, which at 2 days old, tastes quite different from the stuff you buy in the supermarket which can be several months old. 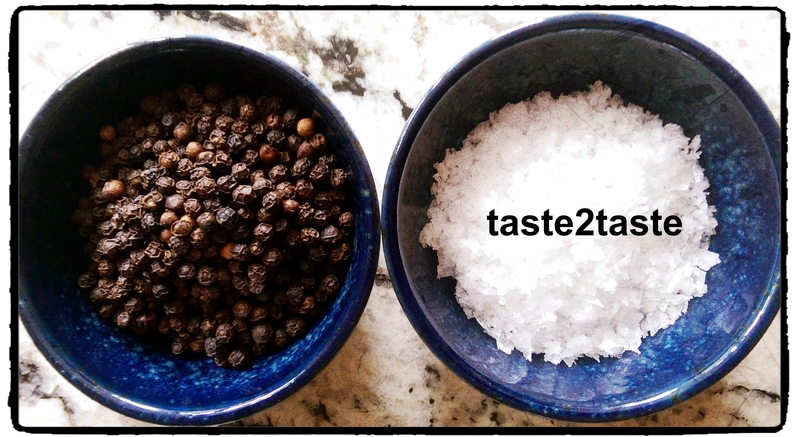 I can vouch for that as Ben showed us the difference from the cupping to the tasting! 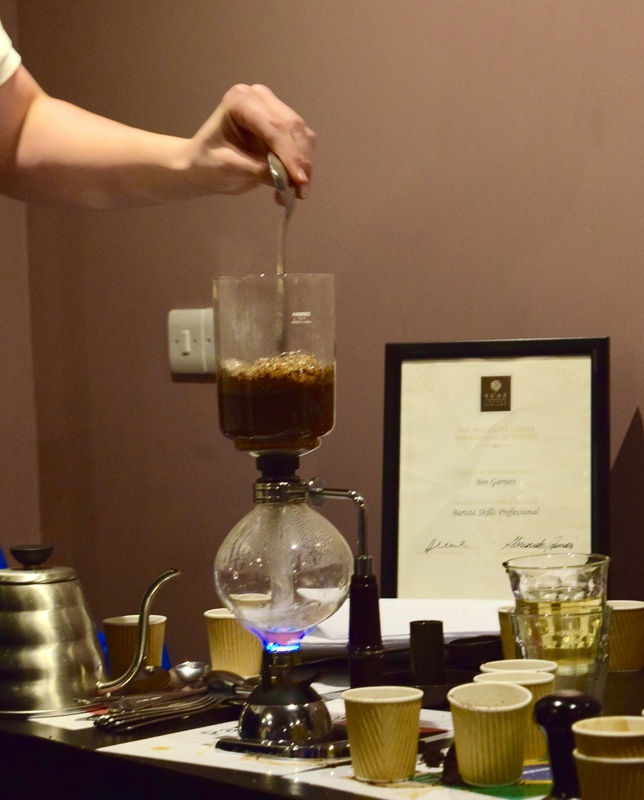 Ben also demonstrated a few different methods of brewing coffee using a Chemex, Aeropress & Syphon. I learnt a lot and it was a great way to spend a rainy night tasting coffee with Ben the World’s Youngest Professional Barista. This sounds like an incredible experience, Ben certainly sounds like an upcoming talent to watch for the future… I’m off to order some Malawi Chikali Medium Roast immediately!